Peel asparagus and trim ends to equal length. In a large saucepan, bring 3 quarts of salted water to a boil; place asparagus into boiling water and return water to a boil. Remove asparagus from pan and place in a bowl of ice water to stop the cooking; drain on paper towels. 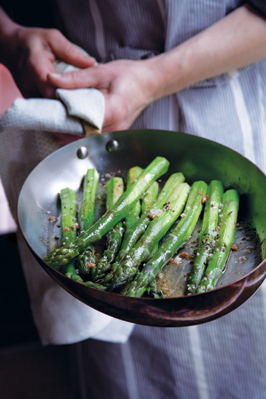 Place the butter in a large frying pan and heat until it turns hazelnut brown in color; add asparagus, carefully stirring until heated through. Squeeze the juice of a half a lemon over the asparagus. Serve at once with a sprinkle of Fleur de Sel and grindings of black pepper to taste. Note from Chef Jacques Boiroux: A drizzle of Balsamic vinegar may be substituted for the lemon juice if you prefer a little touch of sweetness.